In a medium mixing bowl sift together the flour, cinnamon, baking powder, baking soda, salt and walnuts. In a large mixing bowl beat together the oil and sugar until well blended. Add eggs, one at a time, blending to incorporate. Add vanilla and maple extracts. Gradually flour mixture until well blended and smooth. Alternately fold in carrots and raisins. Bake 25 minutes until toothpick inserted comes out clean. In a small deep saucepan combine the sugar, lemon juice and water. Bring to a simmer over a medium high heat without stirring until the edges begin to color, about 5 minutes. Gently swirl the pan and continue to simmer until the color turns amber, about 2 minutes more. Using a wooden spoon, stir in heavy cream. Transfer to a small bowl and allow to cool. In a medium mixing bowl beat together the butter and cream cheese. Add the powdered sugar and beat until smooth. Add vanilla and maple extracts until incorporated. 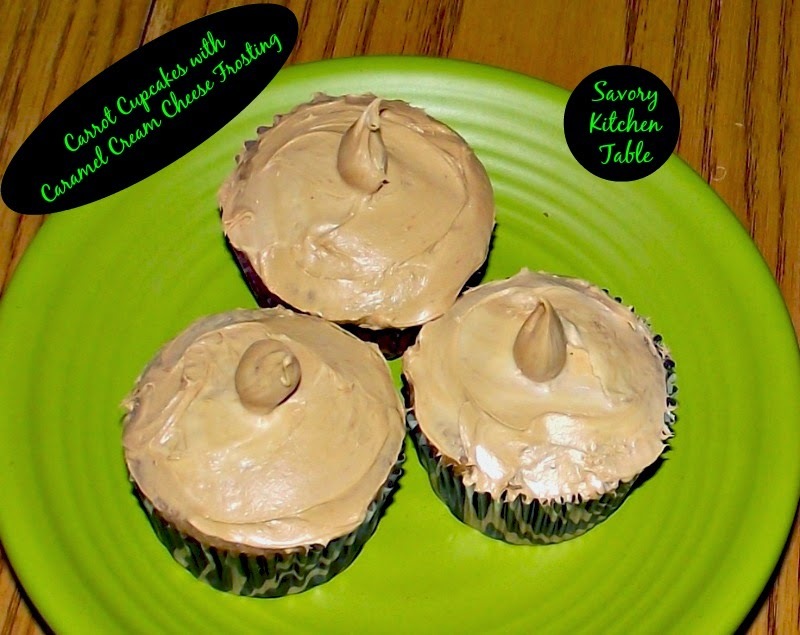 ***For a more decorative cupcake DO NOT blend in caramel mixture with cream cheese. Instead, thinly ice each cupcake and then pipe a ring around each cupcake top. Spoon some caramel mixture into each ring.